Garibaldi, along with Giuseppe Mazzini and other Italian reformers, were leaders in what was known as the Risorgimento, or the rebirth and unification of Italy. The Risorgimento demanded an end to foreign occupation, a government that empowered ordinary people, and the overthrow of papal rule, or the "pope as king." October 23, 2017 - K.P.JohnsonA groundbreaking article appeared in Theosophical History Vol. XIX Issue 1, January 2017, pp. 5-37. 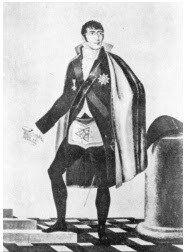 Co-editor of Letters to the Sage Patrick D. Bowen has analyzed the careers of Kenneth Mackenzie and associates and discovered evidence suggesting intertwined roots of many post-1875 occult groups in the work of a group of British Freemasons. This is the “occult doctrine” promoted through the ages by the followers of Satan going back to the Garden, as newly propounded by Helena P. Blavatsky – The Secret Doctrine (Pasadena, California: Theosophical University Press, 1963), Volume I, page 414. Volume II, pages 234, 235, 243, 245. FROM MACKEY'S REVISED ENCYCLOPAEDIA OF FREEMASONRY VOL.1:Brother George Fleming Moore printed articles entitled Notes from India and Co-Masonry in the October, 1910, and February, 1911, issues of the New Age, of which he then was the editor. When we say the good friends of Madame Blavatsky assert that she never claimed to Mason we refer to members of the Theosophical Society. Shortly after the issuance of our article, Notes from India, we received a letter from Brother J. H. Fussell of Point Loma California, taking us to task for intimating that Madame Blavatsky ever claimed to be a Mason and urging us in the strongest terms to correct what he deemed an error and one that is unfair to the memory of H. P. Blavatsky.